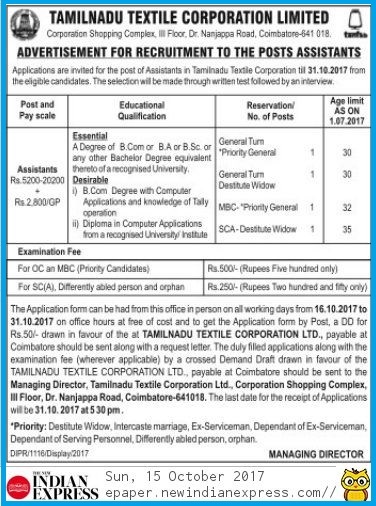 Tamil Nadu Textile Corporation (TNTCL), invited Appliction Forms for the Post of Assistants in Coimbatore. The TNTCL Assistants Job Notification Published Today 15.10.2017, the Last Date to send the Application Forms is 31.10.2017. TNTCL Assistant post Notification, Number of Vacancy, Eligibility, Ager limit, Qualification, Selection Procedure, Application form and Complete Details you can get here download. All The Best. Educational Qualification: A Degree of B.Com or BA or B.Sc or any other Bachelor Degree equivalent there to of a recognized University. TNTCL Assistants Posts Selection of the Candidates will be made through Written test followed by Interview. The application form can be had from the Office in person on all working days from 16.10.2017 to 31.10.2017 on office hours at free of cost and to get the application form by post, a DD for Rs.50/- drawn in favour of the Tamilnadu Textile Corporation Ltd. payable at Coimbatore should be sent along with a request letter. The last date for the receipt of application will be 31.10.2017 at 5.30 PM.